Emily de Molly is back for December, and I am so excited to be sharing some swatches today. These are deliciously wintry without being "omgholidaymagic". Those colors have their place, but a little variation is always awesome. 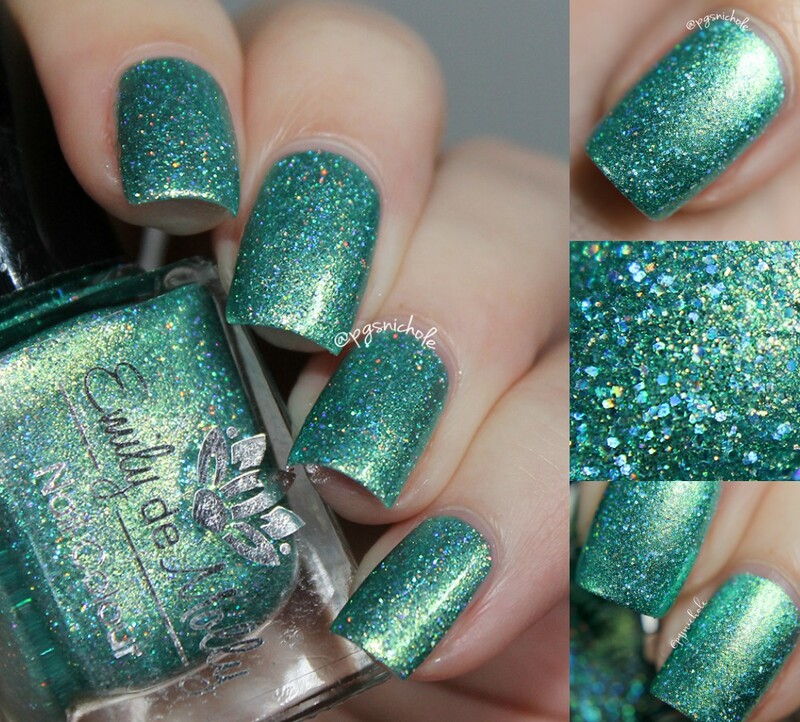 This is an aquatic shining sea-glass green filled with holo glitters on top of a glowing metallic underbelly. It has a weirdly reptilian quality that I find very appealing. It is blinding and sparkly...and I can't wait until I see it in the sun. 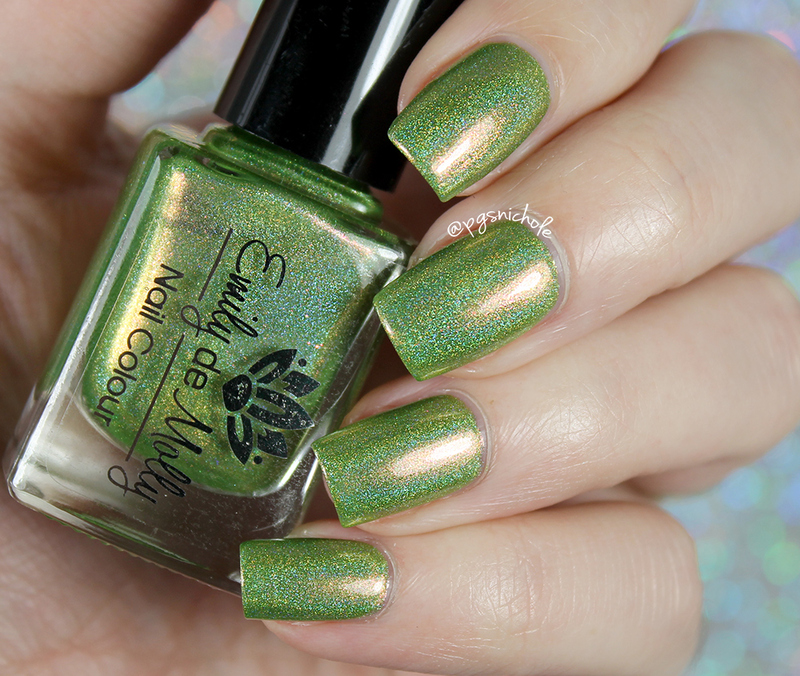 The formula is super smooth and even for such a complex polish, and I used two thin coats followed by a layer of Seche Vite for these pictures. Let's all take a pause for a moment and breathe heavily. This is my kind of shade, right here. This is a pale blushed lilac with a rosy shimmer. At certain angles the shimmer gives off a super-saturated goldenrod glow...and then folds back into rosy red. It applies like the smoothest cream and I used two coats plus a layer of Seche Vite for these photos. This is the bright breeze of spring. It is a brilliant green linear holo with a pronounced coral flash. It isn't my normal choice, but I actually quite like this shade. It is cool enough so that it doesn't make me look like a lobster, and the corally glow makes it unusual and fun. It was a slight bit more sheer than the others here, and I used three thin coats plus a layer of Seche Vite for these pictures. 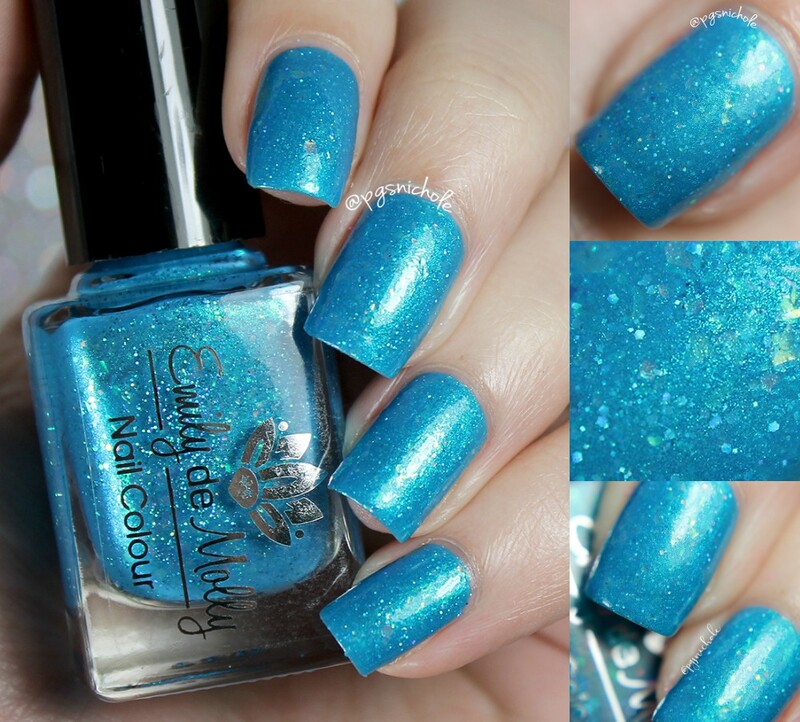 This is a brilliant tropical azure filled with iridescent flakes, iridescent glitters, and tiny metallic blue hexes. It reminds me of an electric mermaid. The formula was super smooth and easy, and required no fussing or tweaking to get the magic to lay right. 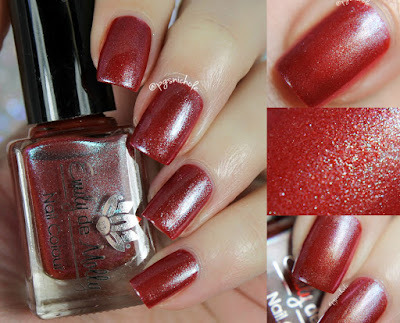 I used two coats plus a layer of Seche Vite for the pictures below. Do you ever wonder what unicorn skin looks like? Well...I am voting for it to look something like this. This is an ultra-pale cool pink leaning lilac filled with shifting iridescent flakes. It reminds me of that one crayon, you know the one. You always wanted to use it to color Barbie's dress, but it never actually transferred to the newsprint...yeah. That one. Which means, for me, this is a triumph of color. Take that, Crayola. The formula on this one was way nicer than a shade this close to white has any right to be, and I used three thin coats plus a layer of Seche Vite here. This makes my red-loving heart sing. 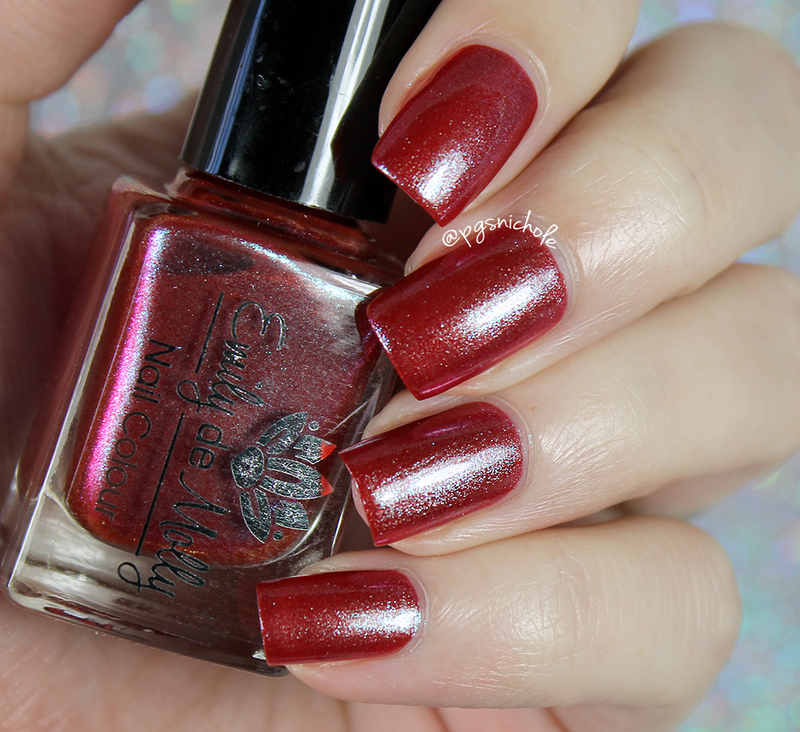 It is a holiday berry red filled with an icy flash of shimmer and flakes. It feels very futuristic to me, like something Blade Runner era Sean Young would wear. It feels sophisticated and vampy, and I can see this being great all-seasons red. It applied smooth and easy in two thin coats. Because shinies, I threw on a layer of Seche Vite too. There are at least six polishes that I can't live without in this post. For sure. Do you have a favorite here? Let me know in the comments which one you need to survive. The Grand Tour is EVERYTHING! Gawd - can your swatches make anything look bad really though? NO! All are pretty but I really love Path of Travel. I want that one. 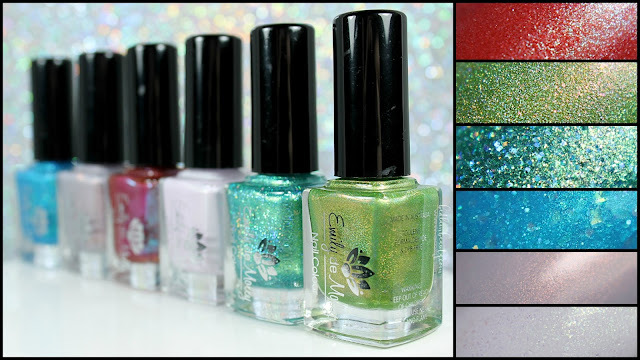 These shades are all absolutely stunning. The Path of Travel shade is simply to die for!!! NEED!! The grand tour and path of travel are my must haves. Gorgeous. The shimmer in Path of Travel is ah-mazing. Wow, this collection! Path of Travel and Mortal Self are my faves. Im not normally a green fan but Mortal Self is screaming "Buy Me By Me!" Oh my gosh - these are all so lovely. I cannot pick a favorite! You know we have quite a similar taste and Path of Travel is breathtaking! Mortal Self is a close second for me though! Life's Highlights is so unique!!! I love it!!! Oooohhh I really like Mortal Self! These are incredible! I could seriously stare at your swatches all day lol! You and these swatches are dangerous for my wallet!